More often than not, the recipes I share here come along with a story. This is usually the case because I get my inspiration for many things throughout my everyday life. So what’s today’s story? Well, a good friend of mine recently asked for my help as she’s planning one of the most important days of her life; her wedding! It will be quite an evening, filled with friends, music, dancing, and a paleo feast! I come into the equation when it comes to food. It has been be both a struggle and a huge expense when it comes to finding caterers that will satisfy a good paleo menu. We’ve resolved this issue quite easily, as we will be making the food ourselves. So, as we dig through piles a potential recipes, I will try my hardest to share all the favourites here with you. When I say we’re making everything, I mean that we are going the whole 9 yards! We are covering all aspects, including things that could seem trivial like the vinaigrette for the salad. 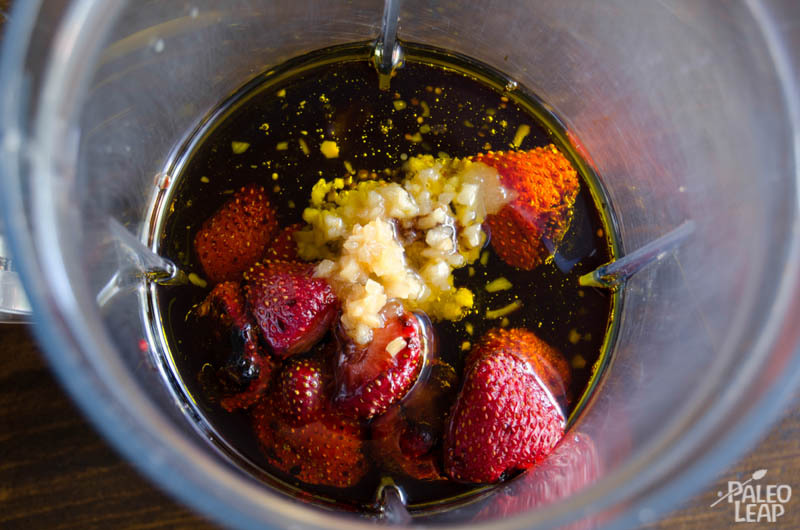 Guests will get to top their greens with a selection of home-made vinaigrettes and this strawberry balsamic one will be an option. It happens to work out just perfectly, because strawberries will be in season. This happens to be very important! Haven’t you noticed that buying strawberries out of season means you are gnawing on something unnaturally large and tasteless? In season, those berries tend to be much smaller and full of delicious sweet flavours! This is even more accentuated in the recipe because the strawberries are roasted, which creates for a much stronger sweet taste. I also love the idea of pairing such a sweet juicy fruit up with the sour of balsamic vinegar. Usually it can be hard to match up two different distinct flavours, but they happen to be anything less than complimenting of each other. Try it for yourself! This vinaigrette is a great addition to the collection of healthy paleo vinaigrettes and dressings that I’ve created. It’s great with just about any salad, but especially with simple and fruity salads. The raspberry and spinach salad is a good example of a salad that goes perfectly with this vinaigrette. Rinse the strawberries and remove the stems. Line a baking sheet with foil, folding the edges up so that you create a small wall on all sides to prevent any juices from running out. Place in the oven and roast for 15 to 20 minutes, or until caramelized. 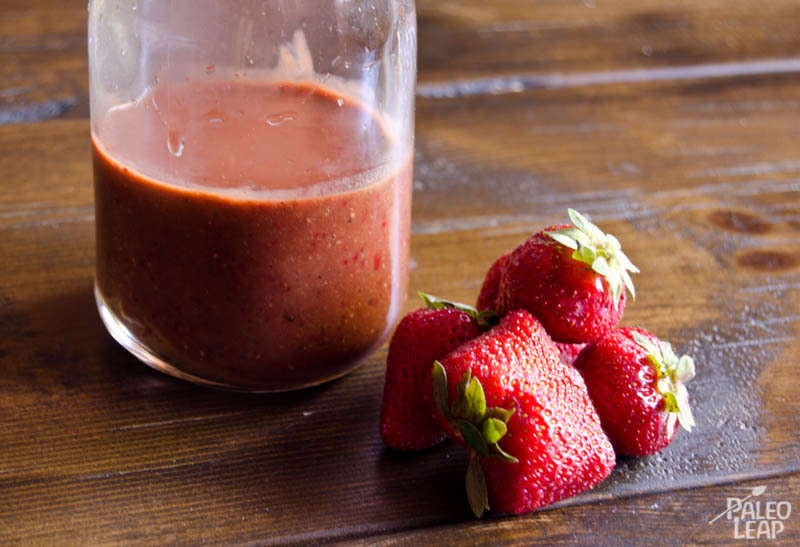 Once the strawberries have cooked, add all the ingredients to a blender. Be sure to include the juices that came out of the berries while roasting. Purée the mixture until smooth and consistent. Serve cold and keep refrigerated.